Wish you all a very Happy Vishu!!! 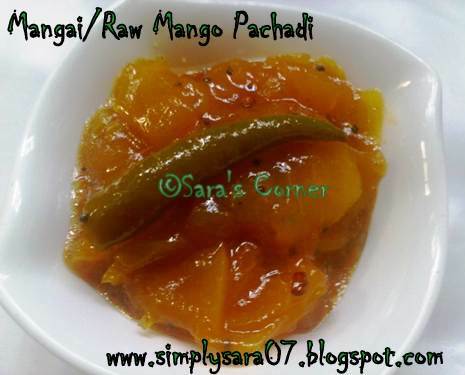 Mangai/Raw Mango Pachadi is a traditional South Indian side dish prepared for the New Year. Wash, remove skin and cut mango into thin slices. In a wide vessel/kadai, add mango, jaggery, water, green chilli, sambar/chilli powder and salt. Boil well in medium flame until mango cooks and becomes thick and blends well like gravy. Season it with above ingredients and add to the gravy. In a vessel, add mango, jaggery, water, green chilli, sambar/chilli powder and salt. Pressure cook for 3-4 whistles and season it. You can try microwaving too in a microwave safe dish with same ingredients above. My preparation is Method 1. Tangy Mangai Pachadi is ready. Serve with hot steamed rice or sidedish for sambar, kootu and curd rice. Checkout Kerala recipes for Vishu here. You can also use mango with skin. Veepam Poo/Neem Flowers - If you are using fry in ghee or oil separately and garnish it. Ah..you are tempting me Saraswathi..I want to have it now. Wow i love pickles so much will soon try this looks mouth watery. I love all the three methods. My method is usually method 2, but on stove top. I am going to try to add green chili and try that flavor next time. And, wow addition of sambar powder, a new twist for me. so delicious and yummy ! !